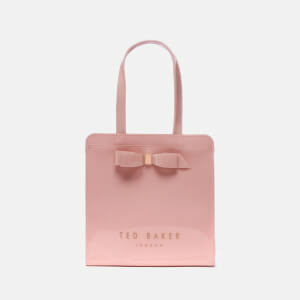 Ted Baker's 'Small Icon' bag has been updated with a 3D bow to the front. Made from high shine PVC, the small 'Arycon' tote bag features two grab handles and an open top for easy access. The small shopper is finished with printed silver branding to the front and back, and iconic slogans down both sides. Silver tone hardware. Dimensions: H: 25cm x W: 25cm x D: 12cm. Handle Drop: 18cm. 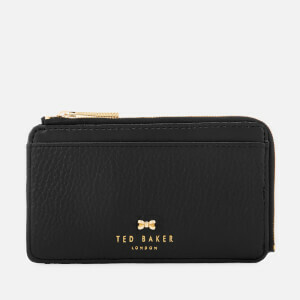 Receive a FREE gift from Ted Baker when you spend £100. 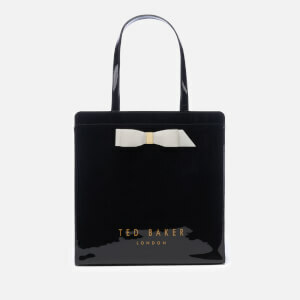 Simply use code FREETED at the basket and select your chosen free gift from the selection. *Cannot be used in conjunction with other offers. Exclusions apply.